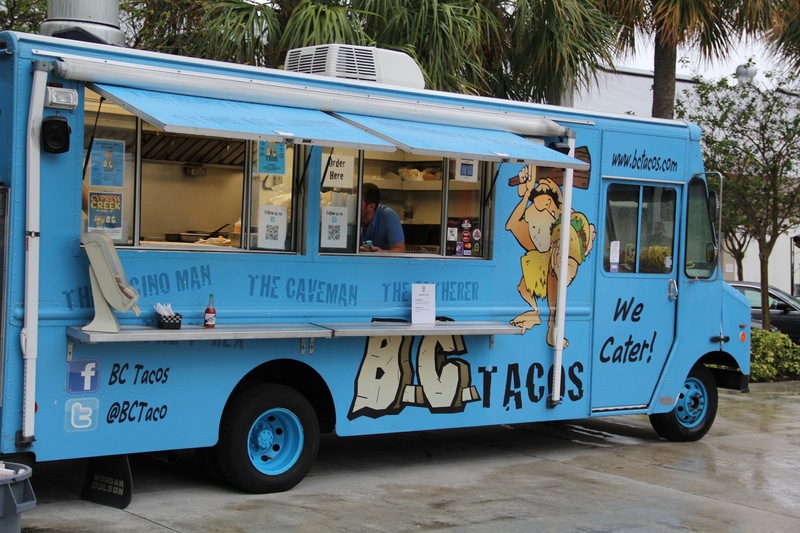 BC Tacos is a South Florida based food truck offering a variety of classic and inventive gourmet tacos. Their Mission: To change people’s views of tacos by offering a unique and modernized product, exceptional service standards and measuring our success by our followers. Their menu includes The Hunter (steak), The T-Rex (chicken), The Barbarian Bacon Cheeseburger, Cave Dweller (chicken caesar), and Mommoth Mahi, among others. They are available in a hard corn tortilla, soft flour tortilla or you can also make your taco into a Brontosaurus Bowl, which is served in a lettuce cup. The even offer a dessert – Dino Delight (smore). We caught up with BC Tacos at a #TEAMAIME event in downtown West Palm Beach. For the event there was a fixed menu for each truck, so we tried both tacos offered for the evening. The Gatherer featured fried avocado, lettuce, shredded mozzarella and ws drizzled with a chipotle mayo. A great vegetarian option, the avocado was crisp and delicious. The Passover Taco was amaaazing with braised brisket, potato latkes and a carrot slaw. The brisket was like butter and the flavor was perfection. It was a fan favorite of the night. The guys who run the truck are super nice and I love their theme. I’m going to have to track them down again sooner than later to try out The Caveman, which is a 1/4 lb. burger, steak and braised beef short ribs sandwiched in a hard taco shell and then wrapped in a soft tortilla – yes please!